Click on the thumbnails for enlargements, then "back". It's a good thing we both like salmon! Daughter Suzanne got us into this family outing for Suzanne/Andy Harshman, Older daughter Karen/Duncan Chalmers, Ellen/Bob, Paul/Nancy Harshman, Charlie/Kelly Harshman, Casey Harshman/Molly, Erin Harshman/Mark and other family and friends. Left Santa Barbara by air Friday, June 15, through San Francisco to Anchorage, AK. 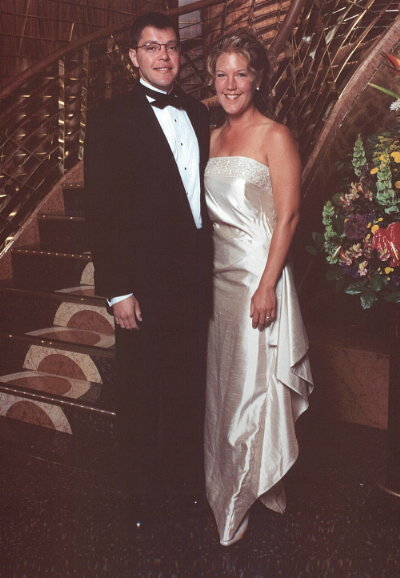 Karen and Duncan were on the same plane from San Francisco northward. Astounding views of snow-covered AK mountains and glaciers on approach to Anchorage. Rental car at Anchorage airport; Duncan showed good mastery of packing technique, getting all our stuff into one car, along with us... Surprised by the temperature - weather was sunny and in the mid to high 60s. Experienced the midnight sun, almost. It never really got dark; just dusky at about 2:30 AM (According to Duncan - we did not see it...). Met the Harshman group at the hotel in the morning; breakfast and then re-packing(!) for the drive south toward Seward, where we join the cruise ship on Sunday. Quite a sight in the hotel parking lot with several cars and MUCH luggage being juggled! 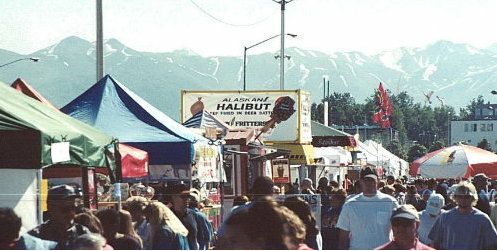 Visited the Anchorage market downtown; a combination of farmers' market and county fair! Arts, crafts, foods and music. Alaska souvenirs much in evidence along with clothing and funnel cakes, all in tents or booths set up in a city parking lot. All very festive, even offering horse-drawn carriage rides, and with the snow-capped mountains in the background. Andy came up with a salmon quesadilla - very tasty. Very sunny and quite warm. Are we really this far north? Anchorage was badly damaged in an earthquake some thirty years ago, and the downtown shows recent construction (not very tall...) and appears quite clean and well-kept. On the way out of town we stopped for a panoramic photo of the inlet and the snow-covered mountains across the water just west of town. Then on to the Old Seward Highway and southward toward Cooper Landing, about half-way to Seward, where Suzanne had arranged cabins for us (on opening day of the salmon fishing season!). On the way, the highway skirted Kenai lake, a large and very pretty area surrounded by high peaks, with more snow. A lot of melting this time of year, with cascades down the steep slopes. Saw no critters, but lots of beautiful and huge scenery. After a 2-1/2 hour drive, arrived at Cooper Landing, a fishing enclave spread out along the Kenai river with B& Bs, fishing outfitters, lodges, cabins and the various service spots, diners, etc. Found Gwin's Lodge Cabins, which is clearly out of the 40s and 50s but with more modern upgrades. Very rustic for a bunch of city-dwellers, and well-used. Dusty roadways but a good restaurant (with a 9-year-old cashier! ...all in the family?). Late in the day most of the group decided on a rafting trip on the Kenai. 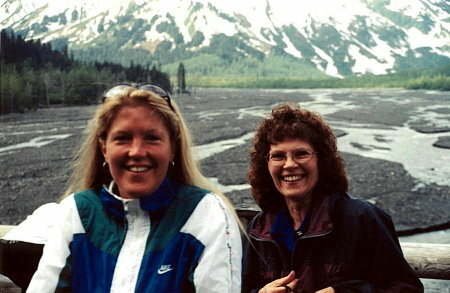 Suzanne opted for horseback riding, having done whitewater before. Les, the keeper of the Lodge, made a point of getting us set for the river trip. Drove a short distance to the launch location, where we were given instructions and the opportunity to wear a lot of rain gear. Wisely, Paul asked Carl what he was going to wear, and Carl said, "Just shorts, a t-shirt and tennis shoes." We all decided against the rain pants, galoshes and slickers; it's only water, after all (cold water; about 39 degrees at this point). Lots of snow and glacier meltwater. Turned out to be mild whitewater, and not so scary after all despite a river that looked pretty rapid from the shore. Our boat captain, Carl, said this was Level 2 water, with spots of Level 3. 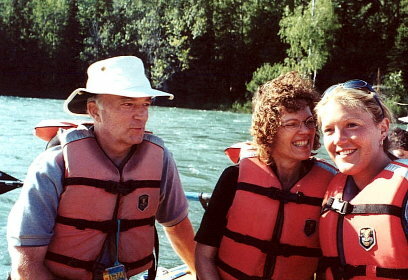 He gave us a choice on the rougher moments, and the group always opted for the rapids. Spotted Bald Eagles and nests. Carl pointed out the thin Alaskan topsoil visible on the steep riverbanks. The poor undersoil keeps the trees from growing really large here. This was the first day of Salmon season, and there were MANY fisher-folk at the mouth of the Russian river to hook a fish (limit three per day). The ones we saw hauled in were of the 1-1/2 to 2' variety. There were cleaning stands set up in the middle of the river; it's a rule to put all the leavings back into the river. Got wet a couple of times in the waves formed over rocks. Carl actually rowed the inflatable raft - it looked like hard work, with long oars and a heavy boat full of people, yet it made a huge difference. 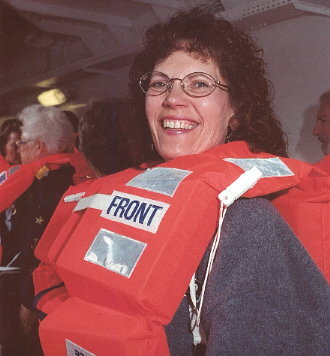 Note that Carl was the only steerage we had, since the boat was floating, not being driven. He made it look easy to avoid the rocks and the banks. Fathers' Day, June 17. What a wonderful way to spend this special day! On a completely new (for us) adventure with both daughters (and grandchild-to-be) and so much other family here also. We drove on southwest toward Seward, where our cruise ship awaits boarding this afternoon..
Paul and Nancy Harshman had heard that Exit Glacier is a good spot to stop, and we planned time for this during the trip. Approached this glacier driving upstream next to the outflow creek/river, full of granite silt of all sizes brought down by the glacier over the years. This stuff is perfect material for highway construction, etc, and is so used. Forests including spruce, etc. in the lower region of the outflow (the glacier is retreating, in general), followed by the Alder and Cottonwood newer growth in the more recently-exposed valley. Nearer the glacier face, the valley was essentially just granite stones and low brush. Just as we approached the scenic overlook facing Exit Glacier, spotted a moose cow and two calves across a marshy area next to the highway. Critters! Amazing sights. 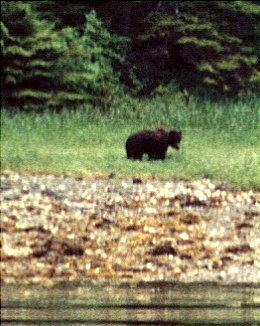 Duncan and Karen saw a black bear near the river. Broke off a little piece of the glacier; just ice, after all, but a nice blue color from its density... Beautiful waterfall cascades from high up on the mountain slopes; join into larger falls down low and then into the river, milky with granite silt. Arrived in Seward and our first impression of the ship was that it was larger than the whole town! This is a 55,000 ton vessel something like 700 feet long and 12 decks high. Then off to explore the ship; but even before that, a snack. 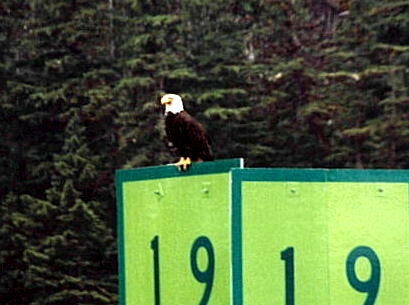 Eagles flying nearby as ate. We attended an introductory program by some of the ship's crew and watched a part of a movie (gave it up - we can do this anywhere!). Cast off a little late due to some troubles with one of the tour buses bringing people to the ship. A busy day - a good sleep and awake to the wild terrain of College Fjord. Glaciers with names like Baltimore, Bryn Mawr, Columbia, Harvard, Yale. Seals, sea lions, otters, icebergs in the water, Absolutely remarkable the change between yesterday and today. Very nice narration by the ship's naturalist. 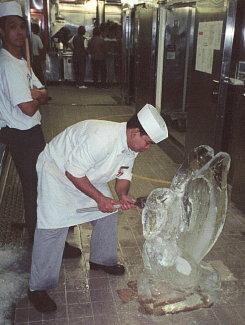 Glacier "calving" at Bryn Mawr. A loud noise, but far away; if you hear the sound first, you've missed the event. Kids saw large calving into water. It's called, appropriately, "white thunder." Ellen has gone to the gym... It has a wonderful view right over the bow! All that happened before about 9 A.M. -- Now that we're up and around, it's time to begin eating again! Dinner is a real event -- a choice of any or all of five or six appetizers, salads, and several entrees and desserts. Different each night, and not a clinker in the bunch! Of course, food is a part of the cruise package, so there are no prices on the menu ... thank goodness. Five-star quality indeed. In the evening, a Las Vegas-style review by the resident dancers and orchestra. Slept in -- Awoke to much ice in the water and rough chop. Some whitecaps in the open water. Entered Glacier Bay later in the morning, and had a presentation on it mid-morning (too long, but interesting). Went to the highest lounge area (Crow's Nest) to see the sights of the narrow channels between glaciated hills giving way to taller and craggy peaks in the background. The bay is in the valley previously occupied by the Grand Pacific Glacier, which has retreated some 65 miles in the last 200 years, leaving a beautiful, biologically new valley with Alder and Cottonwoods, and other new-growth foliage after the scouring action of the glacier stopped. We had been told to look out for bear, eagles, mountain goats, and other wildlife, and we did see seals and pups on the floating ice, and even a bald eagle perched on one small iceberg, calmly floating down the river. Another of these huge cruise ships and two smaller excursion boats were near the glacier as we approached, which gave a bit of scale, but the cruise boats are so big, I'm afraid it does not help much. Up the channel to the Margerie Glacier, a 1-mile wide, 200-foot high outflow (tidewater glacier) from a long ice flow; a classic -- blue-tinted milky (aerated) ice veined with very dark blue clear ice and with dirt scoured from the valley floor. This glacier moves about 6 feet per day, which results in frequent "calving" as it reaches the tidewater. 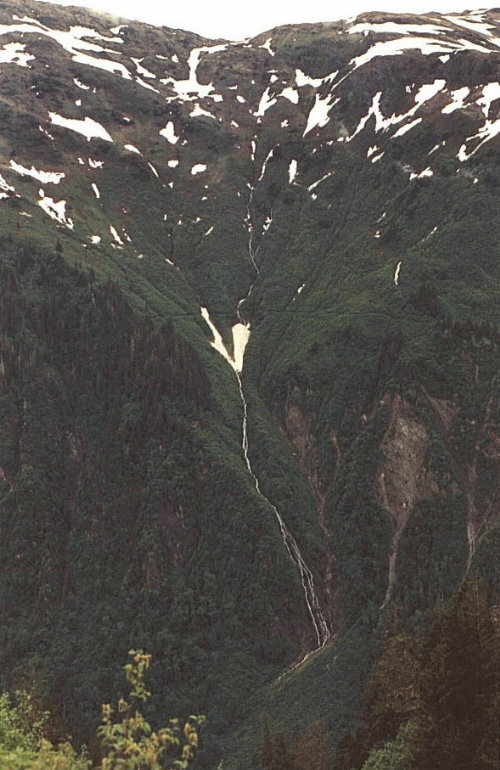 A large meltwater stream escapes below tidewater level, but produces a large ice cave in the lower center. While we were in front of this glacier, many large sections calved into the water, producing large icebergs. The "white thunder" produced as these ice chunks hit the water reminds one just how BIG these things are. The ship stopped some distance from the face, but it was hard to tell how far, really, since the air is so clear, the scene looks closer than it really is. Narration by park rangers helped us understand and appreciate. We're off to a glass of wine with Santa Barbara friend Judy Pochini and Marshall .... 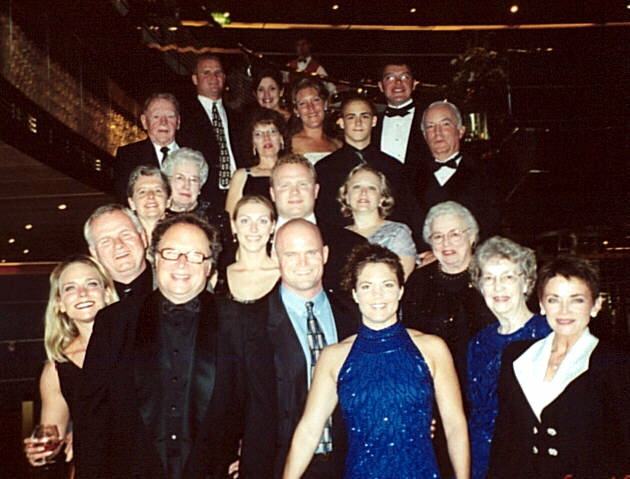 Ran into them on a walk on the promenade deck; small world. We had a nice conversation about current S.B. Newcomers activities (she's a recent graduate), mutual friends and the cruise. 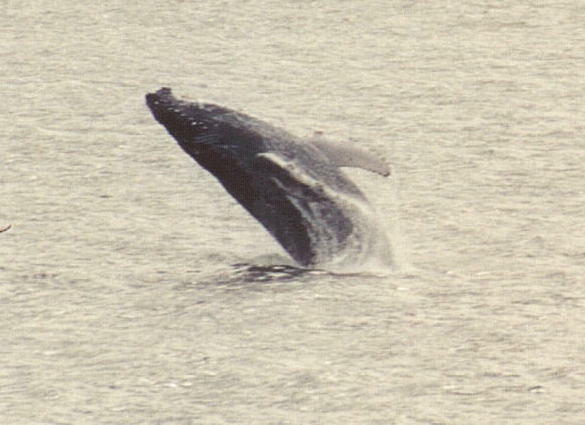 As we were on the way to dinner, outside a pod of humpback whales spouted and dove (tail flukes visible; no broaching...), at the mouth of Glacier Bay. 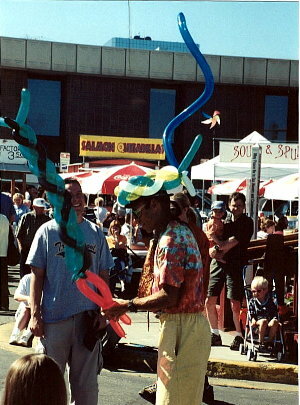 Evening, a comedian/magician delighted the crowd with a short juggling and "magic" show. The opening was the real treat. A rabbit emerges from a lighted canister, climbs boxes and stools to the microphone and then appears to speak to the group, introducing the show. Then he retreats to the canister when done. Most original and entertaining. Later, one of the children on board was heard to remark about the talking rabbit! Dancing at the Ocean Lounge later. June 20, our 37th anniversary! Awoke to find the ship anchored off Sitka, Alaska. Up early for landside excursions in Sitka; a couple of the fancy lifeboats doubled as tenders to shuttle people back and forth to land and ship during the day. In 1804 (the year Ohio University was founded) - the Russians battled the Tlinget natives for Sitka - at stake were pelts, etc. 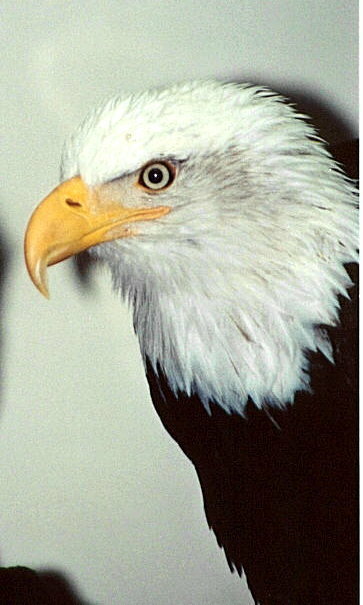 There are Bald Eagles thick as flies here! Said to be 30,000 pairs in Alaska.. One flew over the tender as we docked. Just plain impressive. Bus driver Gary Smith picked us up at the dock, for a bus tour of Sitka's island. 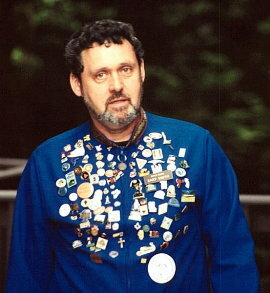 Blue (navy) Russian-style tunic, covered with badges traded with visitors over the years. Not a Russian, however. Very interesting commentary as we drove over most of Sitka's improved roads. A very small place. Onion domes on the cathedral near the docks identified the Russian orthodox cathedral. 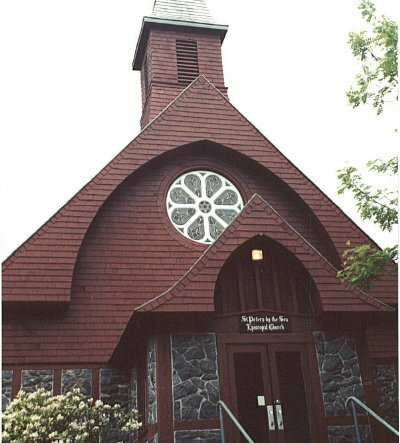 This modern building replaced one destroyed by fire. All the icons and religious artifacts were saved by townspeople -- many heroic acts were documented. Interesting and very old paintings, many protected from fading by silver coverings, outlining the oil painting below. Faces of religious figures were left showing on images of the Last Supper, etc. Lit a candle for Mom. A group of Sitka's women gave a presentation of Russian dances -- very entertaining. The dances often tell a simple story, about such things as boys and girls meeting at a dance with initial reticence giving way to happy dancing. Random facts; Sitka has only about 14 miles of roads, but 6,000 or so cars! The airport is a reworked Army/Navy base (begun as a communications center in 1939) - the site of an "underground hospital" was pointed out, but a little www research later showed the principal use was for coastal protection - guns, radar, etc. During WW-II, a Japanese ship sank in the harbor, unknown to the U.S. until much later. The crew were never found. Visited the Sitka Raptor Center, where injured or sick Eagles are cared for. A chance to be really close to one of these magnificent birds. We were to find out that these are really scavengers. The ship's naturalist would later explain that they first try to find something dead and eat it. 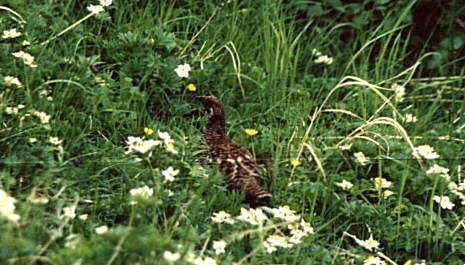 Failing that, they will try to take a fish away from a smaller bird (even hassling a much smaller necessary). If all else fails, they will hunt for live prey themselves. Nevertheless, their majesty is intact. Seeing them perched or in flight is inspiring. 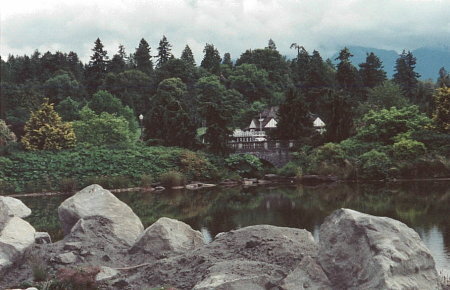 The Center also featured a trail through the temperate rain-forest that is coastal Alaska. Certainly closer to Santa Barbara weather than the stereotype cold and snow of "Alaska." 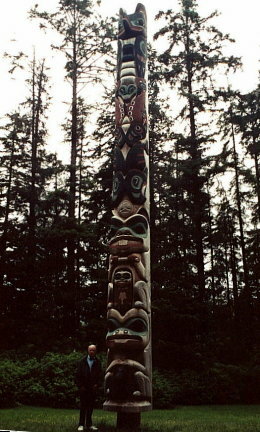 Then to Sitka National Historical Park (the smallest National Park), for a look at historical totem poles by Alaska natives, preserved here; ravens shouting their multi-"song" repertoire as we walked through the hemlock-shrouded rain forest. Very lush foliage, some unfamiliar to us Ohio/Californians. A nice rocky stream which will fill with returning salmon after July. Walked back to the Raptor Center (it's really a small place, and we had a little extra time and wanted to pick up a sweatshirt). 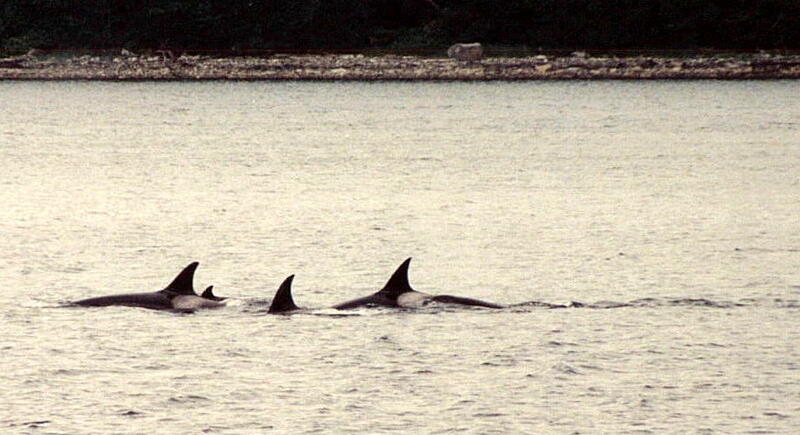 In the afternoon, we had booked a small-boat wildlife excursion up the Sitka Channel. While on the outbound trip, discovered "ZooBooks" (San Diego - 1-800-477-5034), excellent reference material, which the crew offered, perhaps as a replacement for critters not seen on a particular trip. In the channel, as we passed the Sitka waterfront, more than a dozen Bald Eagles were perched in the trees over the fish-processing companies; waiting for discharge of tailings from the process. There are those lazy scavengers again. 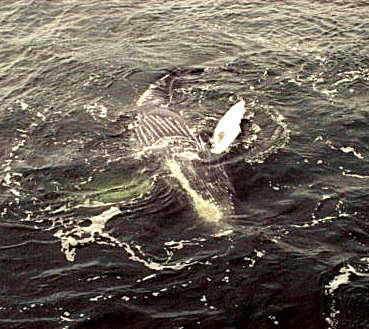 Unprotected water was too rough for the small boat to go to the good whale areas. The captain was forced to stay in water sheltered behind a chain of small islands. About 35 miles at 30 knots up the channel - very smooth water. Hemlock and spruce growing in the older areas, Alder typically the first one to colonize a slip or glaciated bare area. Alder fixes nitrogen in the bare soil, inviting other trees later. More eagles perched in trees, on poles; everywhere! It's wonderful to see these birds in the wild, after such restricted viewing elsewhere in the U.S. The boat captain and the crew were very knowledgeable and did excellent Q/A on the area. They were very careful not to disturb the wildlife with our viewing. Pulled away quickly when one harbor seal appeared nervous about our presence. Encountered Sea Otters and pups - in a kelp bed and on rocks, playing "King of the Mountain." Rare out-of-the-water sightings. This was the high point, and a decent substitution for the whales, but still a bit disappointing that we did not see the big guys on this excursion. On the return, rain/wind squalls made the water quite rough, for a roller-coaster ride. Tour guides returned us directly to the Veendam and we set sail for Juneau in the early evening. A quick change for dinner; Karen and Suzanne gave us gifts of a portrait taken by the ship's photographer and a bottle of Dom Perignon 1993. Excellent! Staff and family sang "Happy Anniversary" after the usual delicious dinner. Our waiter, Ari, brought us a ceremonial boot, made origami-style with a dinner napkin! He has been a perfect dinner waiter for us. Then off to a nice piano show with Tommy Bond (show tunes, some singing). Later, we had hot Grand Marnier and played a couple tunes at the piano bar, cut short by the real pianist, an Englishman who proceeded with several Andrew Lloyd Weber tunes and a 50s - 60s sing-along. An hour and a half of flower-power tunes, Beatles, Elvis, and generally great fun. Fortunately, enough other voices that Bob could sing without frightening anyone! All of this fun was accompanied by the roughest water yet; certainly not frightening or unusually bouncy, but noticeable in any case. By the end of the evening, we were once again re-entering protected and smoother water on our way toward Juneau. What a busy and fun anniversary! Awoke on Thursday to the docking process at Juneau, island capital of Alaska. Took the tramway at Juneau to a point near the top of the overlooking mountain, and then took a walking trail to the top of Mount Roberts (inside are 300 miles of old gold-mine tunnels). 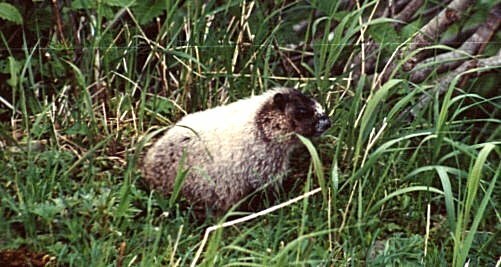 Saw two hoary marmots and a ptarmigan (a pheasant-like bird, with two young in tow). During the walk, saw mountains patched with remaining snow; loud meltwater streams forming string-like cascades down steep slopes; beautiful waterfalls on the way down, strange shapes formed as streams undercut the melting snowpack. Hiked to the top of the local peak on gravel trails. Overlooked Juneau and Gastineau Channel. Saw old worked-out gold mine remains; one has collapsed into the channel due to tunnel cave-ins. The tram guide told us people scuba dive and see the intact swimming pool and other facilities now below water. Took pictures of some of the flowers in bloom in the cold on Mount Roberts; one Hosta-like plant turned out to be False Hellebone, a poisonous plant, and the small white flowers a form of Narcissus. Ran into Duncan and Karen on the mountain, coming down as we went up, and when we took the tram back down later, we saw them again in the restaurant. 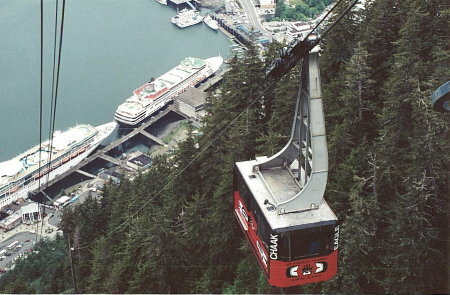 They had hiked down the mountain rather than take the tram's return trip. Steep trail (at least it was downhill). Lunch in a small restaurant on Juneau's waterfront (again those seafood tacos and a good salad). Then off on a wildlife quest. Bus trip (again a talkative and well-informed driver pointed out interesting scenery along the way, including Mendenhall Glacier, where some on the cruise had visited earlier in the day). Excursion boat 35 miles out to Friendly Channel and Barlow Cove (Orcas). Bald Eagle, Stellar Sea Lions on a buoy just like the California Sea Lions on the buoy in Santa Barbara. On one of the many channel islands, Pigeon Guillemots (small black duck-like birds with very bright red feet and red inside mouths). Apparently both are used for displays during mating. Photographed everything we could, including a lighthouse in the channel, once occupied but now solar-powered and unattended. The house was burned after conversion to solar power, to prevent squatters from occupying it. They are everywhere -- common as sparrows up here, but always magnificent! Sighted a humpback whale and watched for a time; a couple of tail-fluke sightings during terminal dives; surface again 5-7 minutes later for breathing and finally another long dive. Probably feeding in the nutrient-rich water here. In Barlow Cove, sighted a pod of Orcas (killer whales) which looked initially like large dolphins surfacing occasionally to breathe. 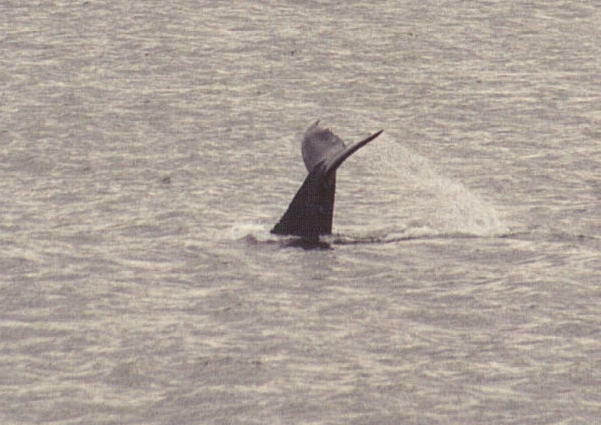 Closer look revealed the typical tall Orca dorsal fins and the black and white markings. Long sighting, indicating no particular fear of the boats or the exclamations accompanying each sighting, many at 100 feet or so from the boat. Considering the outing a success, the captain turned for home, and after re-entering the main channel, he sighted a humpback whale and decided we could spare a few minutes to watch. 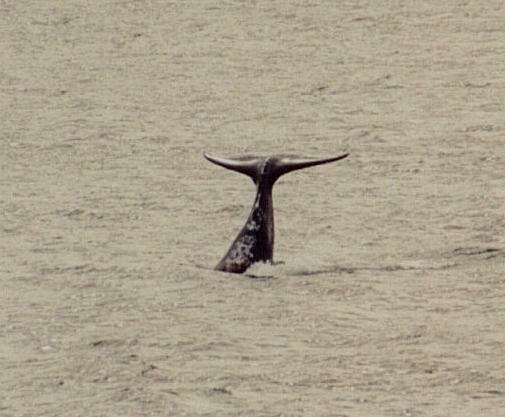 This was a large whale and it exhibited the typical activity, surfacing every 5-8 minutes and at times showing tail flukes during the dive which completed a series of "blows" for obtaining air, which we saw as exposed backbone. 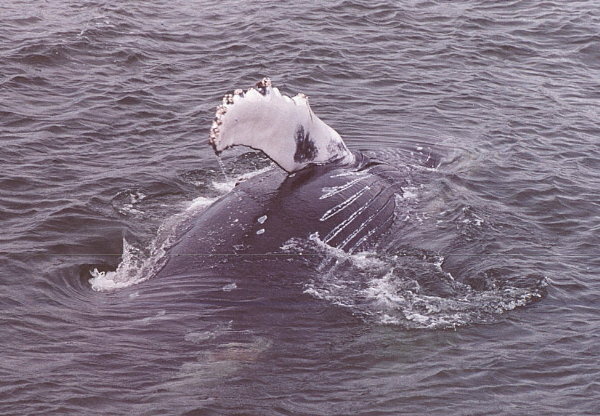 Then, after one dive, a humpback appeared on the other side of the boat. 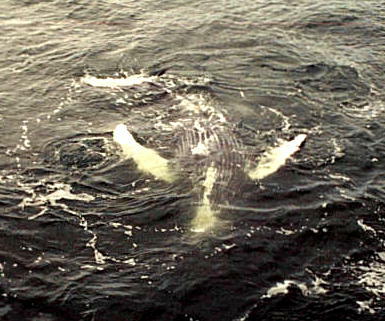 It turned out to be a smaller whale, likely the calf of the original one we had just seen. This whale initially showed the same behavior its mother had, but then, in a complete surprise to crew and passengers, it seemed to begin "showing off" for us, right alongside the boat! 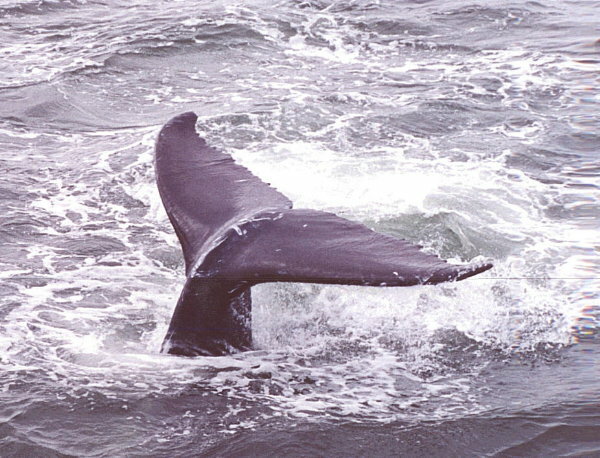 We saw tail flukes and flippers, head out of the water, and slow barrel rolls; full-length floats alongside the boat. A truly remarkable and very rare performance. The crew's young naturalist actually choked up during her exclamation about the event. OK, those were the ship's professional photographer's shots. Now... see those of a dedicated amateur who's had some training at the feet of a master photographer, but can claim no more than extraordinary good luck! Be sure to click on these thumbnails. The enlargements are striking. 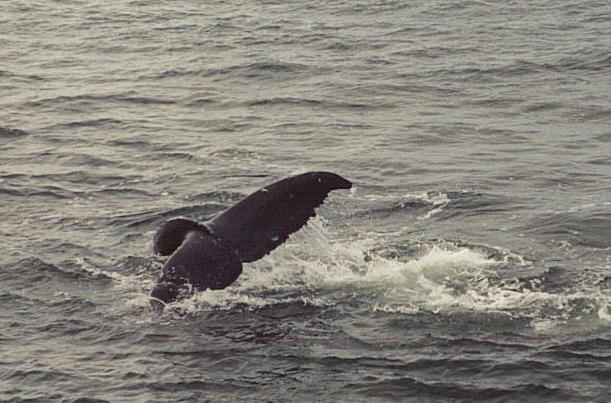 ...and now the Big One: The calf beginning a breach. We watched and photographed as long as we could, but the captain finally insisted we had to leave. As we pulled away, the calf paced us close to one side, and executed breaches, jumps, rolls, and all the rest, continuing until it was finally out of sight behind us. It seemed like one of those Discovery Channel moments. Our crew returned us to the bus and then to the boat just in time for departure. Again an excellent and competent excursion crew, who were as excited as the passengers about the excellent and unusual whale activity we saw on one short trip. After dinner, spent about an hour in the Crow's Nest just looking at the scenery. The hills are smaller near this channel south of Juneau, but much taller peaks are in the background, snow-covered. Several glaciers were visible during the trip, spawning icebergs on the water surface in the inlets and coves. As the sun sets, (yes, we're further south now...) the different light and shadows on the various terrain heights is interesting. In-laws Nancy and Paul Harshman joined us for a while, although Paul fell asleep soon after arriving! Very comfortable winding-down time. Later, visited the Chocolate Decadence set-up in the more informal Lido eatery; seemingly miles of cakes, pastries, massive chocolate dragons and ice sculptures -- millions of calories! We managed to avoid this particular event, having eaten our way through several days already. Sang a few songs in the piano bar and listened to a string group in another of the ship's many lounges...for a short while, then back to our cabin to sleep. Tired. Long day! 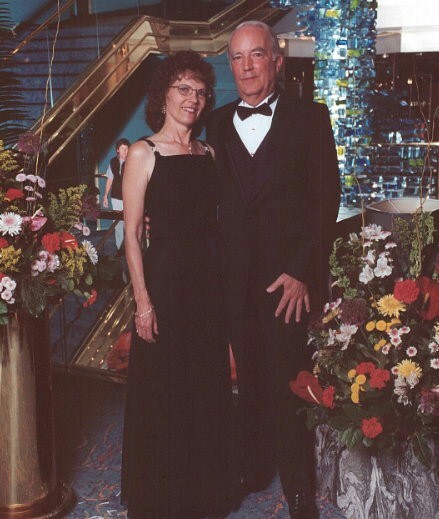 A two-mile walk together on the promenade deck in the early morning, and ready for today's shore excursion. An early presentation by the ship's naturalist on eagles, otters and bears...oh my! Again, most interesting. This naturalist tends to use a lot of descriptive words to get his subject across, and Ellen gets drowsy, but Bob enjoys his delivery. Actually, we had heard much of the material at the Sitka Raptor Center and in other activities, but we heard again about the differences between black and brown bears, about eagle and otter behavior. Off the boat and immediately on a bus to the canoeing and back-country Jeep trek, with the bus driver describing this rather gritty town along the way. A young-looking girl handled the bus very well (our return driver insisted she was older than she looks). Much of the commentary was similar to what we heard in Sitka and Juneau, but Ketchikan is simply not the same. Seems older, and a little more "used-up." Lots of empty buildings (older stores displaced by the Wal-Mart in the outskirts?) and industrial spaces, not too neat. Many, many jewelry stores for the tourists (specializing in gold, of course. ), but not the variety of shops and attractions we saw at other ports. Float planes in action, and lots of barges and containers at the port. Like Sitka, Ketchikan is wedged into a small space near the water (Tongass Narrows), with steep slopes behind, and taller mountains behind that. 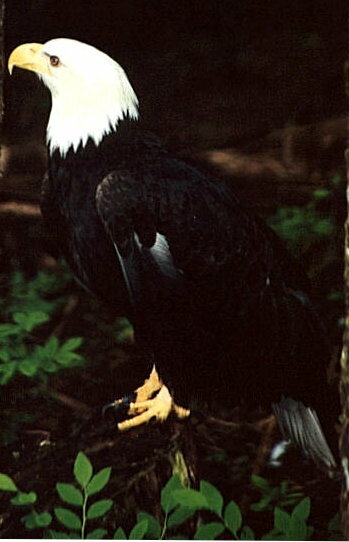 The name means "thundering wings of the eagle." Pretty scenery, as is the rule up here, but few roads and lots of people and cars. Stair-streets are named and serviced by mail delivery, etc., but no cars. They are literally stairs. A tunnel allows a wider street downtown; they could have cut into the mountain, but it would have taken away the Mayor's house... Ketchikan does have rush hour delays on its main street. Like the other cities, an island. The only way on or off is by air or water. We passed a sawmill with those log rafts in the water nearby. Log booms enclosing loose logs in a hexagon pattern, for floating down the rivers. Arrived at the headquarters of the tour operation, and were introduced to four-person Jeeps, with Nancy and Paul (Nancy remarked that we were driving a Toledo-made Jeep, most likely). With guide Ryan leading this CB-radio-connected group of Jeeps and Bob driving ours, took a brief drive up a nearby mountain on roads reminiscent of some he drove in West Virginia years ago. Lot of rocks and potholes. Wet. 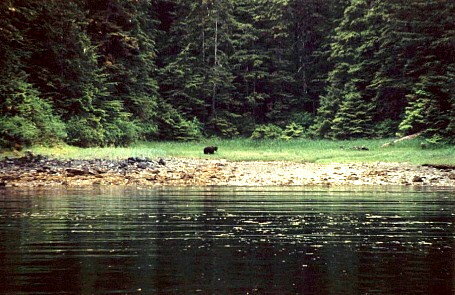 Ketchikan is in part of the temperate rain-forest zone, with something like 150 inches per year. 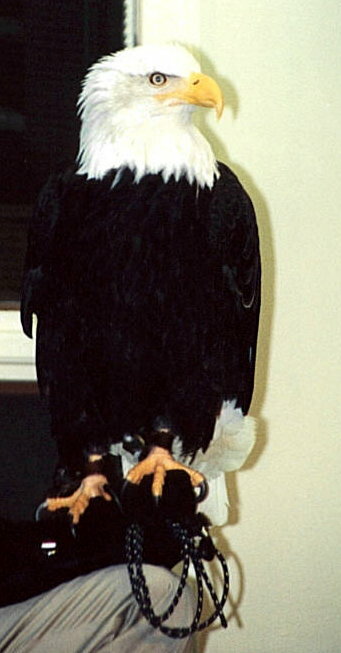 Eagles. Lush growth of the Alder, Sitka Spruce, Western Hemlock that we've come to know, plus skunk cabbage up to five feet high. 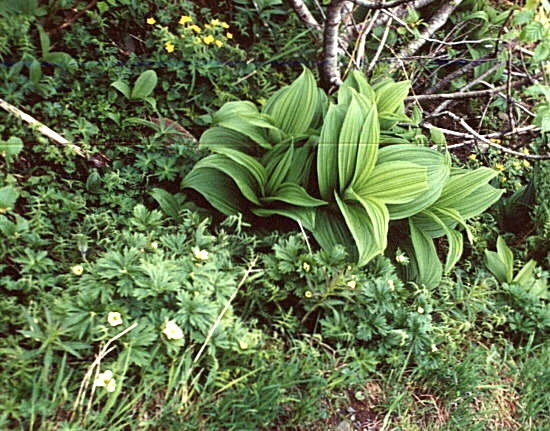 (We're told bears use this stuff as a laxative after the long winter sleep, to "get going" again.) Impressive, but not really beautiful here. Lot of clear-cutting has occurred in past years, but it is part of the history and was interesting to see the rather rapid rate of recovery. Then on to a glacier-fed lake where we piled into a 20-person canoe for a short paddle across to a shelter where clam chowder with cheese "goldfish," smoked salmon (naturally!) and hot chocolate were served, and had a short walk through the rain forest near the lake. Paddled back to our starting point, and bused back to the ship. Frankly, this shore excursion was not the high point of the trip, but we did get to do some fresh-air activities, and spending some time with Paul and Nancy was good. 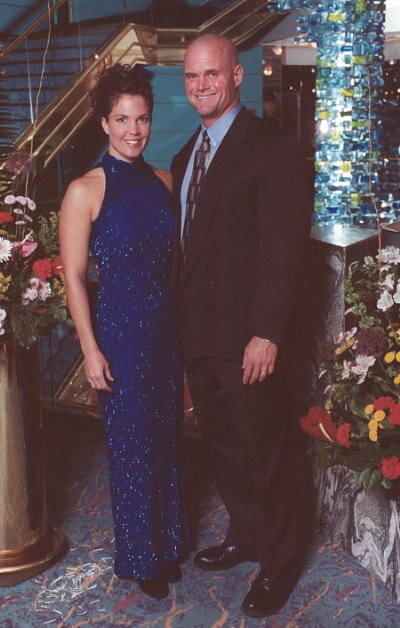 Tonight was a formal night on the ship, so some clean-up was necessary. After dinner, to the ship's theater presentation of 50s-60s songs, which was well done. Quiet time in the Crow's Nest watching the scenery, and a little dancing. Another walk together in the early morning on the promenade deck. Massages for Ellen and Bob in the morning (Ellen's anniversary gift to Bob, by the way), followed by a snack breakfast in the Lido at "the" table with the forward-facing "bay window". Also a little Crow's Nest time, viewing porpoises riding the ship's bow wave, and reported sightings of whales by others. Participated in an art auction - prices on ship are said to be considerably better than for the same art on shore. Bid and won two paintings to "trade-out" some of our wall hangings at home. A Gary Benfield for the dining room (Bob's choice; horse and figures in a style reminiscent of Michelangelo, and a nice companion for our classical-style bas relief nearby), and a Linda LeKinff for Ellen's office - a bright serigraph. To the Ocean Bar with Karen, Duncan, Suzanne for cocktail hour. Karen and Duncan brought another bottle of Dom 1993 which was duly enjoyed! At dinner, celebrated Erin Harshman's birthday with a cake and singing; wait-staff sang an Indonesian "goodbye" song to appreciative applause and more than a few tears. It's been a nice week, indeed. On the formal nights, photographers took portraits of anyone who desired them. They are large files and will load slowly, but they are here... Ellen & Bob, Suzanne & Andy, Duncan & Karen. Began packing in the evening - Ellen took time out for another show. Docked at Vancouver in the morning, and we waited in the Crow's Nest for our turn in the very well-organized departure, in order by immediacy of reservations for departing Vancouver. Stayed at a rather new Sheraton hotel with Nancy/Paul, Casey/Molly, K/D, S/A in Vancouver. In various groups, walked all over town; to the Aquarium, to Granville Island shops, etc. Dinner at The Teahouse, with a great view of the sunset over the water. Oops -- there are prices on the menus again! 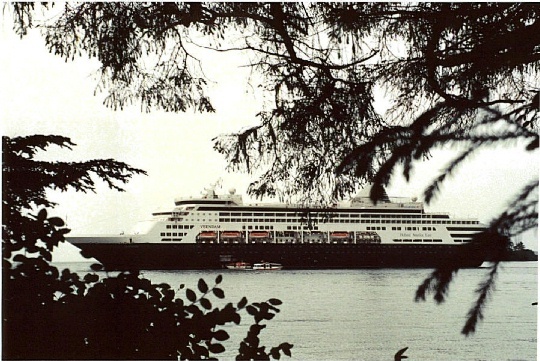 Paul and Nancy witnessed the departure of the Veendam on its next Alaska cruise, northward, as they were arriving at the Teahouse; appropriate closure. Others are enjoying it now, but a part of ship and crew are always ours. It has been special. We're off to Santa Barbara in the morning. So, in the words of the late Douglas Adams, "So long, Alaska, and thanks for all the fish."